I’ve been working on a “secret” project …putting together files and samples to teach Celtic Knot Drafting on March 11. So this week’s Diva Challenge (#304) was right up my alley, as it involves the new tangle from Zentangle® headquarters called Waybop. I’ve used this a few times already, and really like the interwoven quality of the tangle. I decided to carry on with the February heart theme and play with this. I am dipping into the pile I have of pre-dyed/colored tiles. This one was watercolor sprayed with alcohol while it was still wet. The accent tangle is a deconstructed minimalist Cyme. And as far as the “secret”…here is a preview – On another one of my pile of colored tiles. Class is on Saturday, March 11. Space is limited, and it is already filling up, so reserve your spot soon! I’ve been on a bit of a roll this week, keeping up with both my watercolor class (that ends on March 7th) and my online journaling group (goes all year.) Here is a Zendala I did recently, using one of Jenny Perruzzi’s Zencils for collaging on one of my journal pages. And…I finally finished this bracelet I started about 3 years ago. I’m shocked that the cats didn’t knock it over and spill the beads in that time frame. Heading out to Palm Springs and Phoenix this weekend. Sammy Hagar at Morongo, visit Mom, and see the Giants play the Reds in a Spring Training game. It’s a rather quick trip, so we won’t be in Arizona long. Quill You Be My Valentine? Wow! What a week! And other than Flyboy getting called into work this morning, it is shaping up to be another epic week. 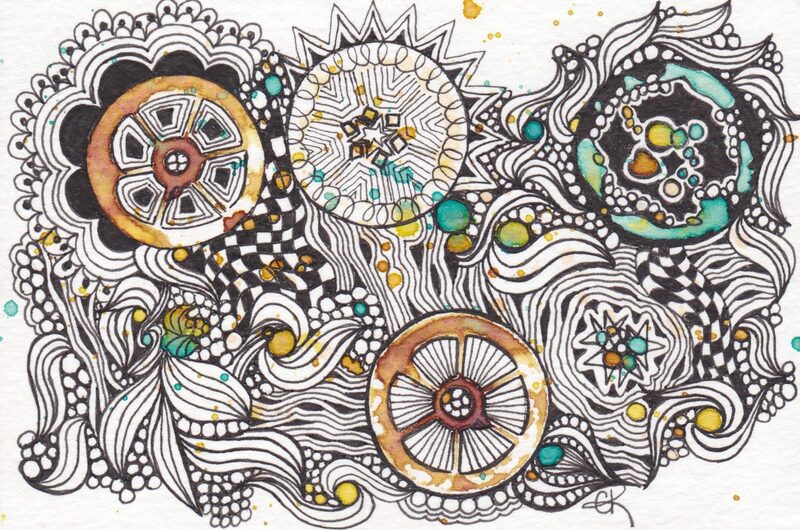 Being a Certified Zentangle Teacher (CZT) makes you part of a really diverse, really cool family, with one common goal. No matter where you are from or what you do, you instantly have community from that one thing. I had the great fortune to meet up with one of my fellow CZTs this week, turning a FaceBook friend into a real-life encounter. Flyboy and I went down to San Diego to have dinner with Suzanne Fluhr and Mr. Excitement himself! And of course, gelato happened. We started another calligraphy class this week, but I had to do one more Boxed letter for Valentine’s Day! On Saturday, we started off the day with a lovely Valentine inspired class applying quilling to Zentangle. We explored the basics of quilling, shapes, and building structures. I am pretty certain everyone had fun. There was a lot of laughter going on. And I think some great creativity. I can’t wait to see what they tangle them into! Of course, I had to finish one of mine quickly for this week’s Diva Challenge (#303). I’m not saying who gets it…but I am pretty sure you can guess. A few students stayed on for a 2nd class on Black Tiles, so I made that a little Valentine as well. So many cool applications on Black Tiles, and everyone is quite unique! On Sunday, I took a book making/color pencil on velum class from Helen Schafer Garcia at the San Diego Botanic Garden. While I did get mine fully assembled, I will have to finish my drawings later. The gardens are beautiful this time of year, with as much rain as we have had, there was no shortage of fun things to draw. I am particularly fond of succulents, for their mandala-like qualities. Whew! Busy week! Fun Week. And off to finish that other journal cover for tomorrow’s class. I actually started this tile during the Super Bowl, from a Zendala drafted with Ann Grasso’s 4-n-1 template (from a class at TangleU 2015.) It goes along the lines of one of my goals to “Finish” things this year. I had been doing the Paradox in the corners, and set it down for the night. Then viola! The next morning, this UMT came out. I also have a bit of a “new materials” review for this as well. I tangled with the Derwent Graphik Line Maker pens in Graphite. I like them, very much. It is nice for when you want a grayer black (also comes in Sepia and Black), and good for some great shading. The shading, I did with Stabilo CarbOthello Chalk Pastel Pencils. Very similar to the General’s but the colors seem a bit more vibrant. I am really likely them, and they can also be blended with a water brush (I have not tried this yet.) I will stock both at the shop as soon as my supplier has them available. Also tangled and shaded this piece with the same pens/pencils. I should have taken a before picture, but it was a mono print piece that I got when I first started taking classes, before becoming a CZT, from Sharla Hicks. We had a great class with Risa Gettler on Medieval Boxed Capitals. Her next technique class will be on February 23rd, on Vining and Diapering. More Medieval stuff! And we will start a study of Uncial this week (Thursday from 5-7.) This will be a project driven class, spaced out over about 6 weeks, with 3 in person meetings, and plenty of contact time via email with Risa. I have been taking a watercolor journaling class the past few weeks, and I am particularly proud this week, of my first perspective piece. I even used one of my own photos, from Cardiff Castle in Wales. And one last piece to share, from my green latka journal. Mostly playing with a loopy string, and trying out a few tangles I hadn’t done before.